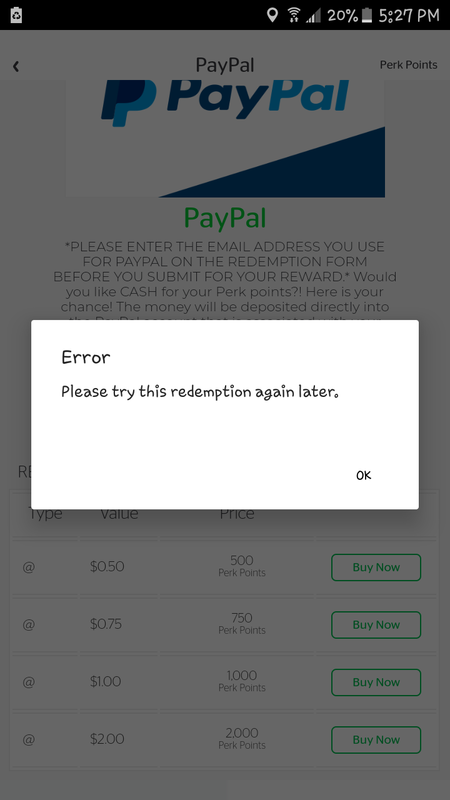 Perk members may have noticed that after attempting to redeem for instant Paypal, you receive an error message. I'm assuming this also applies to the slower Paypal option. I was able to cash out of an Amazon gift card instead I did contact support and their explanation was that my IP was accidentally blocked. I doubt that if I was able to log into my account or redeem Amazon. Well it happened again. I'm not messing with it anymore because it'll just be a waste. They might start to think I'm doing something against the rules, which I'm not. Hopefully they find a permanent solution. Until then, I guess it's Amazon for now. By the way I've made a life time total of about $300 from Perk. Yeah not a lot, but I've got school lunch covered for a while.